Here in the last part of this getting started we explain what can go wrong with the email channel and what you can do to fix it. The most common email problem that Zendesk Support customers contact us for support about is that their customers are not receiving outgoing email notifications. This is often the result of issues that are easily resolved. You’ve set up an external email domain, but have not added an SPF record to your external domain’s DNS. See Setting up SPF for Zendesk to send email on behalf of your email domain. The email notification has been caught in the spam filter in the customer’s email application. To verify that the email notification was sent to the customer, you can easily check the ticket events, which will show you each action that was taken on a ticket. If the notification was successfully sent, then the problem is most likely on the recipient's end of the email exchange. You’ve deactivated one or more of the default email notification triggers. The conditions contained with a notification trigger (or automation) have not been met. The customer’s user account does not include their email address. Read more about troubleshooting and resolving these problems in Troubleshooting email notifications. 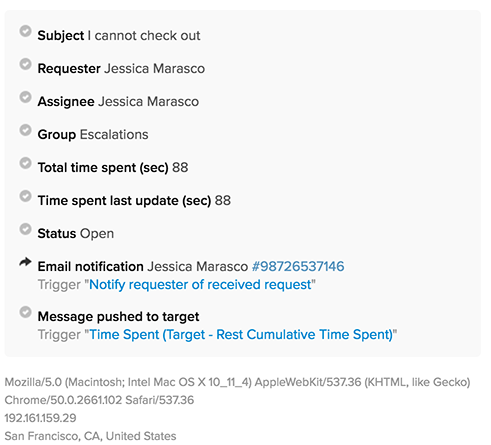 Another email problem that occurs far less often, but that you should still be aware of, is the result of automated email replies created both inside and outside of your Zendesk Support account generating more email notifications than you want. This is referred to as a mail loop and occurs when two automated email reply systems start exchanging messages. As an example, you might imagine that a trigger such as the Notify requester of received request, which generates an automatic reply, may start a mail loop if the email address it sends an email notification to has been set to generate any automated response that does not announce itself as such, like an out-of-office response. Zendesk Support prevents mail loops such as this from occurring, but they sometimes do occur under certain circumstances. You can read an in-depth explanation of how Zendesk Support manages mail loops in About mail loops and Zendesk email.